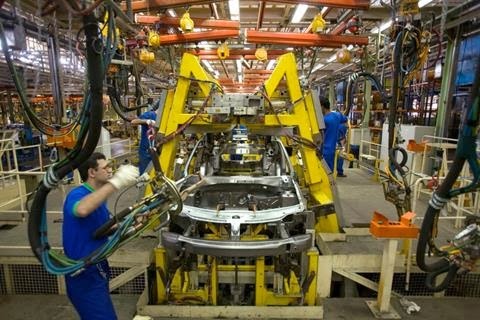 Renault is readying to resume the export of car parts to Iran pending “clarifications” on the easing of trade sanctions against the country, said Gilles Normand, chairman of the French automaker’s Asia-Pacific region. “Such a move would require an opening of financial transactions channels with the country,” Normand added. Creating special banking channels for items that were exempted from sanctions at Geneva talks, including auto parts. Renault sold more than 100,000 vehicles, amounting to 10 percent of the Iranian market, in 2012.The automaker’s activity in Iran was hurt this year by U.S. sanctions, which led the automaker to stop the export of car parts in June. Lol at the terrorist mafioso regime's vaunted industry. They were just assembling components built in advanced countries, something that the uneducated mechanic on my block can do. And they claimed that under the previous regime Iran National used to "assemble kit cars" but now they are "independent" and completly produce cars in Iran. They also claim that the first national car of Iran is the Samand. But looks like they forgot to mention that Paykan that was produced in the millions was the first national car of Iran. I guess the sanctions that still is in force proved what a bunch of lying swines these islamic terrorists are. LOL! Well said,but unfortunately iran cannot rely on these western countries to live up to their end of the bargain,if in the future iran is going to continue to produce european designed cars,all of the components must be produced in iran or from the more reliable asian producers,the europeans are just not trustworthy.Ultimately irans automotive industries will emerge stronger as a result of these problems and the solutions that have been developed to them. As long as the mafia islamo terror regime occupy Iran,it will never be a number one economy like in South Korea and Japan.